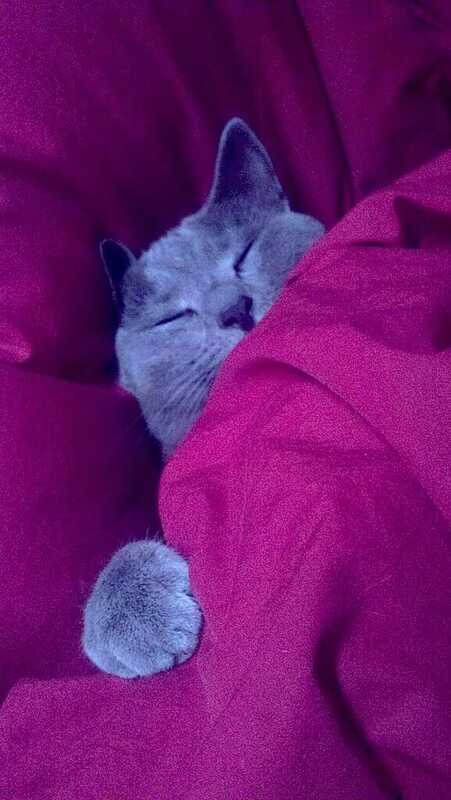 I can’t imagine living aboard without a cat, and Isabelle moved with me to Datawake after three years aboard Nomadness. She’s a constant joy, but there are still feline realities that have to be considered: dining, elimination, and scratching. All are challenging on a boat, given space constraints and the need to handle dynamic conditions. Telling a cat not to scratch furniture is unfair; it is something they need to do (and the torture of declawing is not an option). All you have to do is provide an appealing alternative. 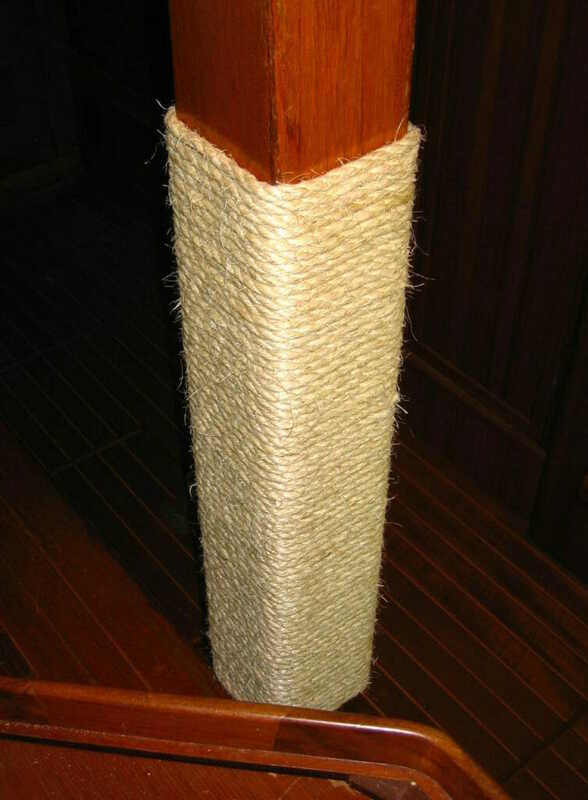 I’ve looked around a few times to see if any commercial scratching posts would be appropriate, and the answer is generally no — the little corrugated cardboard things generate debris and don’t play nice with humidity, and stand-alone posts gobble floor space. The solution is pretty simple, though it varies with the boat. 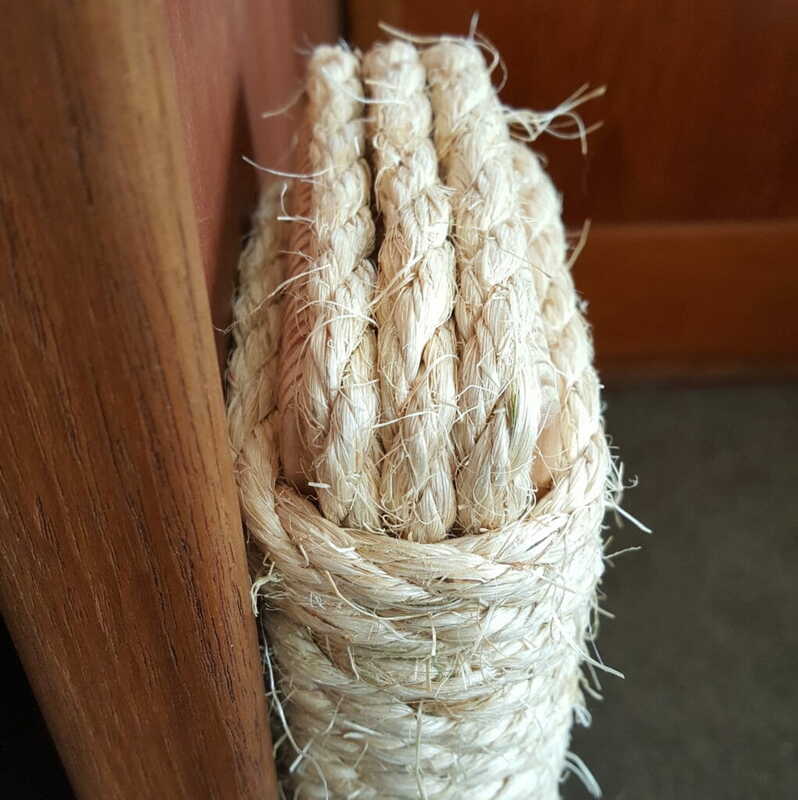 The magic stuff is this Sisal Rope (Amazon link) which I highly recommend after trying two locally acquired rolls that had a heavy petroleum smell. 100 feet of the 3/8″ diameter stuff is about thirteen bucks, and is plenty for the job. On my sailboat, I had a 4×4-inch mast partner in the salon that made the job easy… no added structure to build! All I had to do was fixture one end of the line with a cable clamp, wrap all 100 feet around the post, similarly clamp the other end, and tidy it up with a bit of heat-shrink. 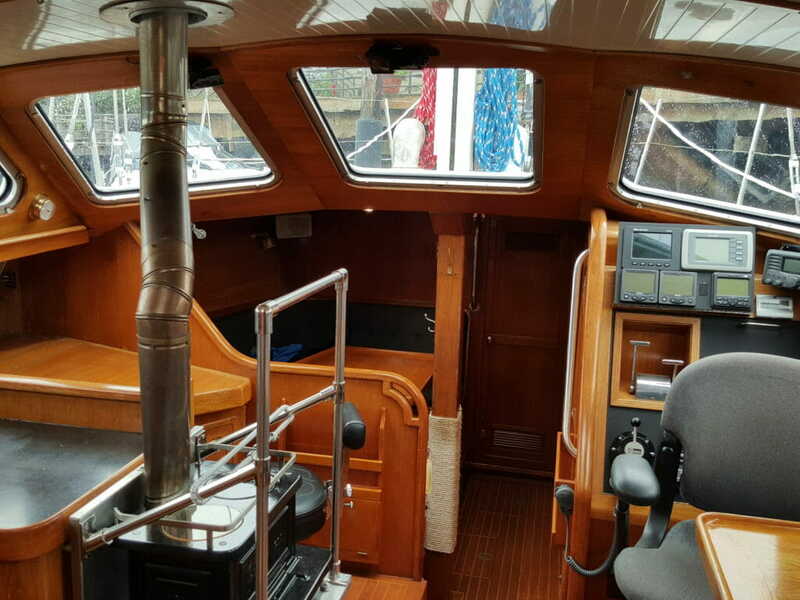 It took a few days to convince Izzy that this was the place to sharpen her claws, but once she got the idea, she lost all interest in the fabric of my pilothouse helm seat. This didn’t add any overhead to the limited space aboard, and after three years there was no sign of any degradation… although some condensation drip from the aluminum-framed window eventually caused discoloration. Making this was simple. I started with a 26-inch scrap of 2×4 lumber, zipped around one end with a router bit just because I was too lazy to do a proper sanding and finishing job, then attached one end of a new roll of sisal rope to the edge of the board down near the floor. This was a 3/8″ cable clamp screwed to the wood. I then did three long wraps around the skinny dimension, which would not only cover the top end but give the overall shape a warmer curve. At that point I could begin wrapping all the way down the post, so I used a stray stainless wood screw to keep the rope under control during that 90° turn. 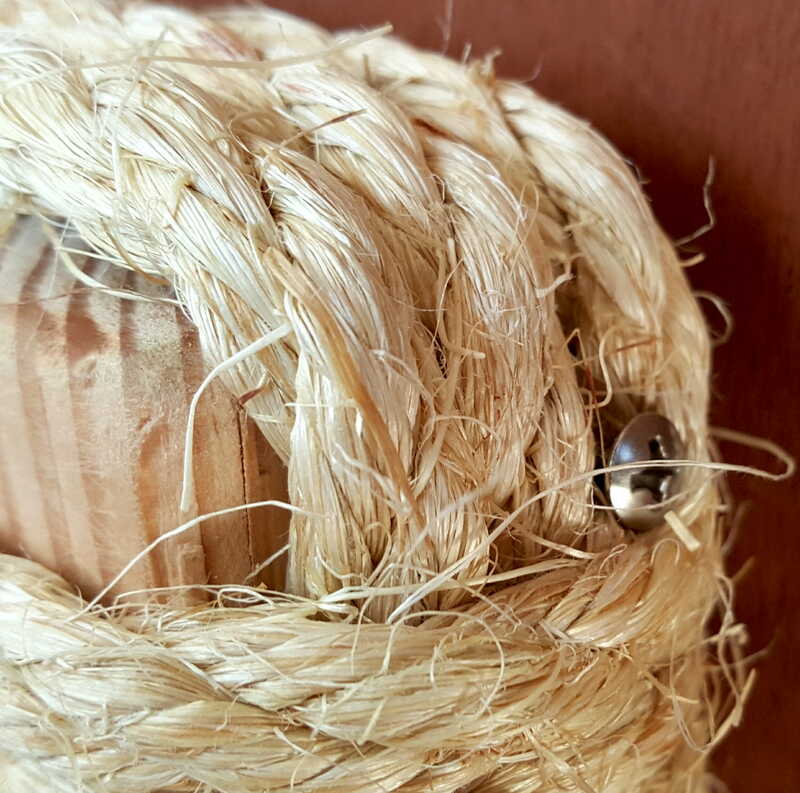 All that is necessary from that point is to keep the wrapping tight, and I found gloves helpful due to the rough texture of the rope. At this point, all that remained was bolting it to the wall. In my case, that was simplified by having access to both sides of the 3/4″ plywood, so I elected to attach it from the rear using 1/4″ stainless lag screws. The only mildly tricky bit was positioning the holes and making a little gap between turns so the drill bit would not damage the rope, but that was pretty easy. Two bolts, an inch or so from each end, are plenty. Had I not had the luxury of bolting it from the back, I would have used a 3/4″ end mill to spot face around a 1/4″ clearance hole, allowing enough room for a 7/16″ socket while preventing any lumps under the rope. Deck screws would also work… but if you do that, please drill clearance holes first so they will tighten the scratching post against the wall. Also, washers, while ugly, will reduce any tendency to split the 2×4 with the clamping pressure of a tapered flat head. And that’s it! 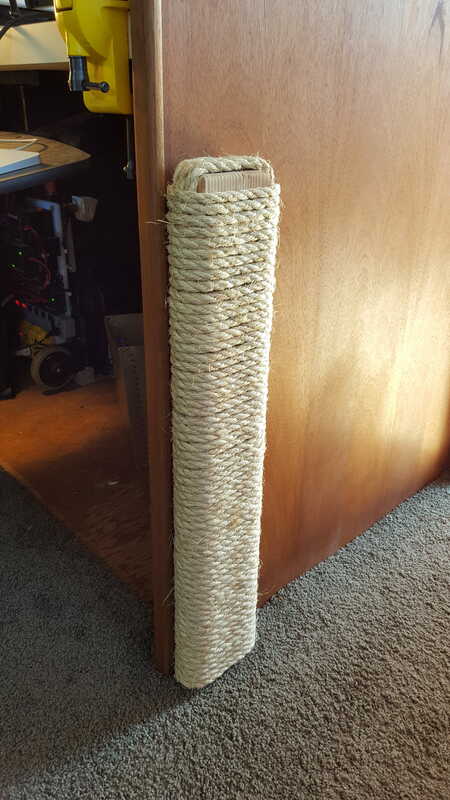 It always seems to take a few days to convince a kitty that the awesome new high-tech scratching post is a better claw-sharpener than the nearest chair, but sisal is the magic stuff and (lacking a proper tree) is pretty close to what their little toes like to feel during this essential maintenance process. I suppose I should go dab some proper water-based polyurethane finish onto that ugly exposed bit of wood… meanwhile, the photo below is Izzy pole dancing! 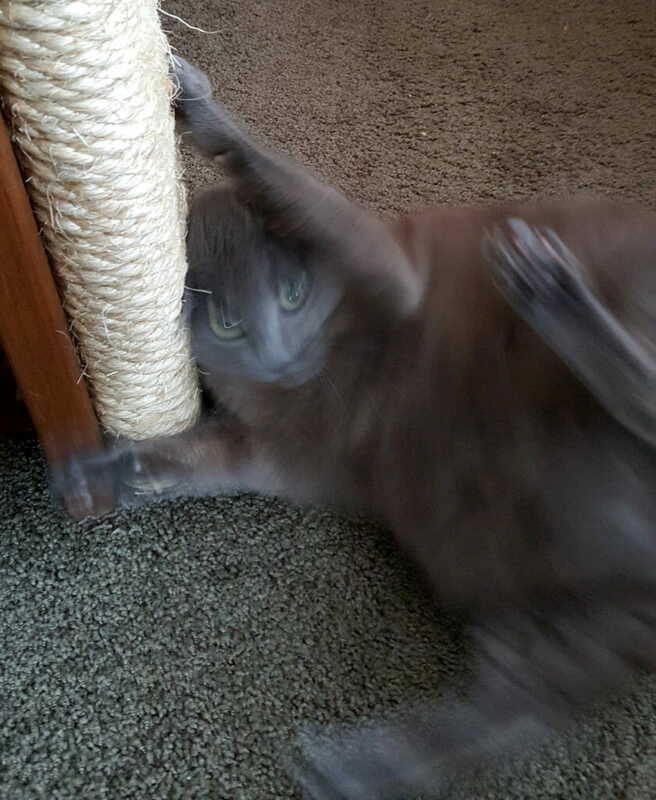 She likes this post.